Ilkeston Road Recreation Ground in Stapleford. Just down from Bramcote Park has over 17 Caravans on site. Could be more now. They were seen breaking the lock off the gate to gain access. Council aware and can’t get out until Monday morning at the quickest. Police made aware and I am concerned as youngsters were driving around on the park in 4x4s. I waited on site 40 minutes and called the Police twice and they never attended. Local Football Teams have had to cancel tomorrow’s games. My phone has not stopped as local residents are calling to see what’s is being done. I am asked to advice people to stay away and any Reports of anti social behaviour the Police need to be made aware. I would like to thank Councillor Jan Goold as Chair of Community Safety at Broxtowe Borough Council who as soon as I made her aware went and had a word with them. Are our County Councillors taking action! To be fair it’s Broxtowe Borough Council and they are well aware. It’s in Stapleford so the County Councillors would not care anyway. Police have been made aware. Broxtowe Borough Council taking the necessary legal action to have them removed. A team is ready to effect a ‘clean up’ as soon as they are vacated from the Park. First thing I did was make the Leader of the Council aware. After I had called the Police. I then spoke to Councillor Jan Goold. Sadly Council can’t do anything until Monday and the Travellers know this that why they turn up so late as they did. More have since arrived. Police have finally attended too. Hopefully they leave the park as they found it when they leave. The problem is the waste. They will probably dump their chem toilet waste all along the back hedge… A health and safety risk. I’d like to know how the Council will deal with this. I live close to the park and right now a large group of lads are hanging around the gate. Intimidating for locals who like to walk across the park or walk their dogs. It’s not right they can stay after having broken the locks. I agree more should be done. Wonder what my fellow ward Councillor is doing. I have not seen him anywhere near the site. More arriving as we speak. I have come out again to reassure local residents as phone won’t stop.. Walking around there are now around 30 Caravans on site. Several people on corner of Washington Drive and Hickings Lane on phone giving directions to others and for some reason the 4x4s are going around the Estate having a good old nosey around. It worries me the lack of Police action. If I broke a gate to gain access to private property would that be okay. Will the Police be asking for Mot,insurance and ownership papers for all vehicles on site. If not why not. They’re doing two drives on our road, Warrender Close Bramcote and what a mess they are doing to the road! I have been contacted none stop since yesterday as the Travellers broke onto Ilkeston Road Recreation Ground in Stapleford. I am advised to tell people that any reports of Anti Social Behaviour need to be reported to the Police, 101 is the number to call. Anyone having issues about Dogs please contact the Neighbourhood Wardens at Broxtowe Borough Council and let them know.https://www.broxtowe.gov.uk/for-you/animal-welfare-and-pests/dogs/strays/ details via this link. You can also inform the RSPCA. I have been told that the Legal Department at Broxtowe Borough Council will visit the site Monday am. They were made aware straight away on Friday but that’s what I have been told. My number is 07740344427 text/call/WhatsApp and I have been talking to many people in the area about issues they have raised but again the advise above should be used in the first Instance to make any reports. I have been informed there are issues at the shops on Hickings Lane too and my advise is the same to anyone who works there. PLEASE FEEL FREE TO SHARE THIS MESSAGE WITH OTHERS AS IT MAY HELP..
will leave the site as they found it. that our legal department have matters in hand. Be assured that everything that can be done at Council level is being done. Drop a cigarette end and it is a £50 fine. Fly tip and you could be fined £50,000 and face 12 months in prison. Yet travelers invariably leave the site they have trespassed upon in an appalling state. It is time for a change in the law. Post-Brexit we can make our own laws and not be governed by foreign judges and the unfit for purpose, Human Rights Act. Couldn’t agree more. At the very least, I understand the local football team had to cancel their match(es). At least 22 children, plus families, disappointed. At most, allegations of theft and a clean up cost to the people who do contribute positively to society by paying into the system. Just visited the site. Broxtowe Borough Council Environment Staff already on site clearing accumulated weekend rubbish. Awaiting legal action hopefully today. 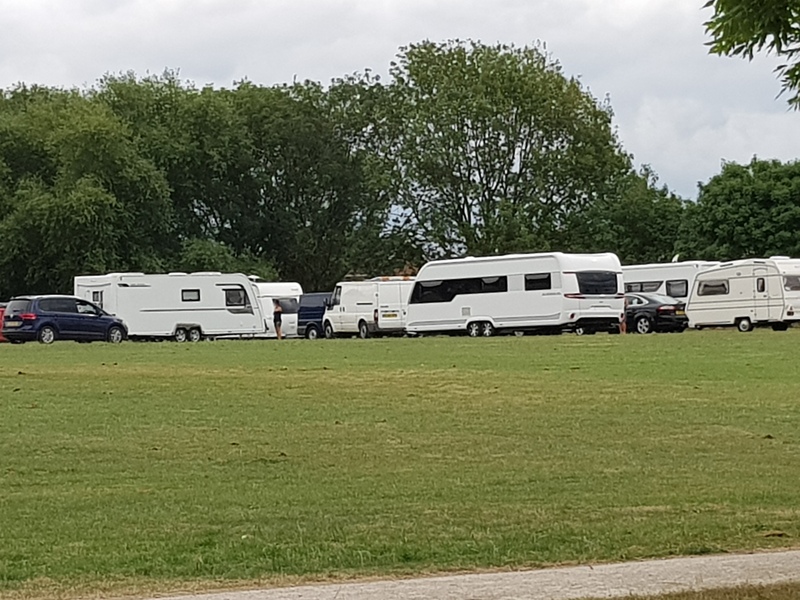 Just received an e-mail from Broxtowe Borough Council Environment telling me that a Magistrates order to remove the travellers from the Recreation Ground has been issued, Police working with Bailiffs to evict will begin ASAP. Broxtowe Environment Teams will follow to ‘clean up’ as necessary. Update on the Travellers on Ilkeston Road Recreation Ground in Stapleford. I was on Bramcote Park earlier today with the Enforcement Officers and a lady with a Vehicle ready to tow away any vehicles. Councillor Richard Jackson came along and gave me an update that the Courts had opened and we were waiting the order. Soon as the order was approved we cleared off Bramcote Park and I locked the height barrier. Police and Enforcement Officers visited all the Caravans on site and placed notices on all the vehicles too. The Travellers started to pack and move off site. They are still moving off site right now. As soon as they are gone I have a team of Volunteers who have been given permission, gloves and bags from Broxtowe Borough Council and we will be on doing a Litter Pick to tidy the park up. I do feel that the residents of Stapleford who live around the Park have been let down by the apparent lack of response and action taken by the Police from the many reports they have received all week. I don’t blame the local Police Officers as they go where they are sent. It’s higher up I blame. I am proud of our Police Officers and PCSOs and feel in not only a honour but a pleasure I get to support them in what they do.